Dodge's TV spots for its SRT range aren't exactly subtle. It’s hard to believe that customers will soon be receiving deliveries of the fastest production car in the world. No, we’re not talking about the Bugatti Chiron but the bonkers Dodge Challenger SRT Demon which has now officially started production. The first car hasn’t even been delivered yet, but Dodge is wasting no time in starting its obligatory promotional campaign for the insanely powerful 840-horsepower muscle car. If the exhaustive teaser campaign is anything to go by, the Dodge Demon will be dominating our screens for a very long time. In fairness, it effectively helped generate hype for the Demon, as the car has been in our conscious since January. The first commercial advertising the Demon once against enlists the dramatic acting talents of Vin Diesel, who happens to be a brand ambassador for Dodge. 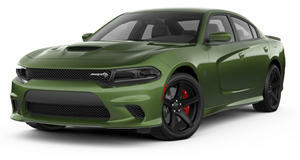 The Fast and Furious franchise is synonymous with Dodge muscle cars, as Diesel’s lead character Dominic Toretto is usually seen behind the wheel of a classic 1970 Dodge Charger R/T. The Demon even made its debut in Fate of the Furious, which gave the muscle car endless exposure since the film went on to become one of the biggest blockbusters of all time. Entitled "Winning’s Winning," this is the fourth Dodge commercial that Diesel has starred in following the "Brotherhood of Muscle" trio of TV spots showcasing the Challenger, Charger, and Durango SRT. Tracing back to the racing roots of The Fast and Furious franchise, the Demon is joined by a pair of Challengers and Chargers duking it out on the race track. Of course, the Demon is primarily designed for the drag strip, as Diesel demonstrates by pulling off a gratuitous wheelie before crossing the finish line. As adverts go, it’s hardly subtle. Then again, this is a road car that can sprint from 0-62 mph in just 2.3 seconds and blitz the quarter-mile in 9.65 seconds at over 140 mph thanks to its 6.2-liter supercharged V8 producing 840 hp. All that obscene power can be had for $86,090, with deliveries scheduled to start later this fall.